The community in which my family lives is a small suburban township, nestled between a large urban area and sprawling rural county; the cornerstone of which is our school district. My husband and I selected this area in which to raise our children prior to our oldest child entering Kindergarten, with the school system and tight knit community being primary determining factors. Now, many years later, with our daughter a Junior in high school, we are still pleased with our decision, but, at the same time, concerned about what the future holds. As with so many school systems across the county, we have observed an alarming, progressive pattern of funding crisis plague our school district. Budgetary obstacles each year are miraculously met and conquered, only to be trumped by increased cuts in funding the following year. Despite strong community support and volunteerism, the concern for the survival of fine art program offerings is starkly real. The importance of maintaining fine arts offerings, as well as other extracurricular activities in schools is indisputable, on multiple levels. Students who participated were three times as likelyto perform in the top quartile on a composite math and readingassessment compared with nonparticipants. Participants were alsomore likely than nonparticipants to aspire to higher education:two-thirds of participants expected to complete at least a bachelor'sdegree while about half of nonparticipants expected to do so. The study found that students in the program performed better in six categories of literacy and critical thinking skills — including thorough description, hypothesizing and reasoning — than did students who were not in the program. Sports programs offer students crucial access to organized physical activity, stress reduction through exercise, as well as increased self esteem and development of ability to work cooperatively. Music, Theater and Art programs are just as important, encouraging self expression, self evaluation, as well as enhancing divergent thinking skills. Accessibility of these essential programs to all students is paramount to holistic learning and success of students, both in school and beyond. As in my community, cooperation and volunteerism is key to ensuring continuing availability of art programs, as well as other extra curricular programs, to students. Reciprocally, successful students are key to a community's ongoing growth and prosperity. In this spirit, THQ and uDraw are sponsoring a contest to celebrate the relationship between community and schools, as well as the importance of art availability for students, the uDraw Your City Art Contest. 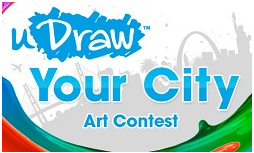 uDraw Your City has launched a nationwide art contest, in which young artists ages 6 to 17 years old have the opportunity to share what they love most about their city through art. Contestants can use a uDraw GameTablet to illustrate what they love most about their city - though entries may also be created in traditional print formats using any artistic medium. THQ and uDraw invite kids to embrace their artistic inspiration and to share "what your city, your town, or your community means to you." Maybe it's the silhouette of your favorite building, a drawing of your friends at the park, or a stencil of your favorite local athlete. The submission period runs through October 31, and the grand prize winner will receive a package worth more than $15,000, including a uDraw, and a $10,000 cash prize that the winner can choose to apply toward a college scholarship. Additionally, THQ will donate $10,000 to the winner's school of choice to help support its art program. Entries are judged on artistic merit (based on age group), creativity, and adherence to the overall city theme. Visit the uDraw Your City Art Contest website for all the details and please share them to support your community, your schools, your students! What challenges is your school district facing? How is your community rallying to support extra curricular programs in your school district? Is your child a budding artist, musician, star of the stage or promising athlete? Share your story with me in a comment below; I would love to know! I wrote this review while participating in a blog tour by Mom Central Consulting on behalf of THQ and received a promotional item to thank me for taking the time to participate. The opinions and experiences above are both honest and my own. Images and information sourced from THQ uDraw site and Mom Central. Art Image. IES Study. Guggenheim Study. I am loving this art contest! I am thinking about moving and the reasons why you choose the area you live at now, is the reasons I want to use when I finally move! What a great contest. 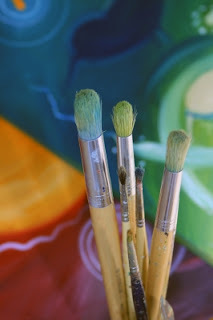 I love anything that encourages young artists - we need them. WHat a great contest and a great cause! I love that idea for a contest. My kids are just learning what a city is. You don't realize how complicated some concepts are until you are explaining them to your kids. I love a good art contest--I'm glad you can use traditional drawing methods to enter. My oldest loves to draw but she's five so maybe if they do this next year!